Our society is not as it should of could be. Too many citizens lack the resources and opportunities they should reasonable expect. Somewhere to live may be hard to find of too expensive, and the cost of living has escalated. The wealth gap, already too large, is increasing. Our initial reaction is to change the government, pass new laws, or fiddle with the economic or fiscal systems. 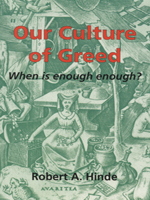 Our Culture of Greed argues that such measures, though necessary, may never be enough. We must dig deeper and tackle the greed that is endemic to our society. Decisions must be based on their effects on others, not just ourselves. We must seek a new world-view where consideration of the good of others is central. The tools for this are already part of our nature, but we need a new orientation in order to use them.